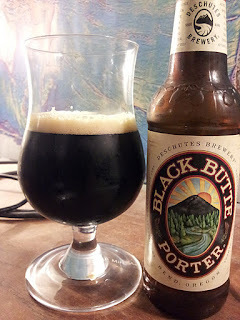 The Patron St. Egman chose wisely when he purchased 16 cases of Black Butte for a nerd conference two years ago; I'm glad I helped him out because I was able to drink about 5 gallons of this, and Mirror Pond. But eventually some remained, which was apparently "best" in Oct 2010, and now I'm clearing it out of the fridge. Whoo doggies, here we go. So this is giving me a headache, and tastes like bitter, alcoholic water - not the delicious porter it once was. (Still with a great head though!) Having said that, it is impressive that after so long it doesn't taste like rancid bile, and that's probably a testament to Deschutes and in no way related to my excellent beer-saving practices. So, I don't recommend you let this, or any other non-cellarable-beer sit in your fridge for too long; you'll just be wasting hard earned beer money. There's a reason they put a date on the friggin' bottle.